Quick Update on Hope in Harvest! | Lift Jesus' Cross! 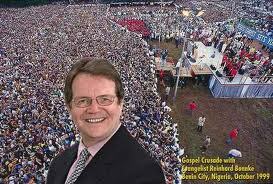 I’m going to Orlando to watch Reinhard Bonnke and Daniel Kolenda cast their first fish net into the sea for souls in America. I am honored to report on this crusade for Christianity Today. I would so appreciate your prayers for me to hear God clearly in writing the article and for sustained health as we drive 18 to 20 hours in two days (Thursday and Friday) and arrive at Amway Stadium in Orlando on Friday evening at 5PM. THE CAPTAIN OF OUR SALVATION IS BRINGING MANY SONS TO GLORY!!! This entry was posted in The Blood and the Glory, The Cross and the Christian and tagged Daniel Kolenda, harvest, Orlando, Reinhard Bonnke. Bookmark the permalink. 3 Responses to Quick Update on Hope in Harvest! Hallelujah! I’m praying for you, sis!!!! Becky and Roxann, thanks so much for prayers and for cheering me on. What a crusade! I will be sending a blog report in a few minutes here, but I want you to know what a help it is to me to have prayer backing us up. I can’t begin to explain the blessing of watching souls come to Jesus! And I met up with a lot of “homies” or “peeps” from journalism, people that I work with in the freelance world. Met new photographers, journalists, broadcasters, and enjoyed that aspect of the crusades as well. Awesome time! Now I can say, “I was there when the first net was cast–and I have the press badge to prove it!” Ha ha!